Ralph Charles Conde, 33, was loved by family and friends. 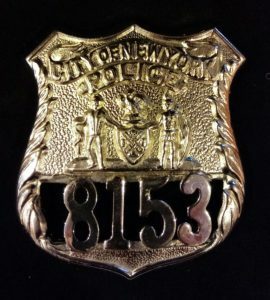 While remaining under the U.S. Navy flag, Ralph took an oath to serve the communities of New York City as an officer of the law in the NYPD 2007, where he has been an “Outstanding police officer” as stated by his peers. Ralph was for God, Country, Family/Friends and Sports! Ralph is survived by his loving parents, Carol & John Conde. He was the beloved brother of Alan and Lydia Yurich, Anthony and Carol Yurich and Peter Conde. Ralph was also survived by many aunts and uncles including his nieces and nephews, Aidan, Josie, Kiel, Jason and Isabella. Funeral will be at Cherubini-McInerney Funeral Home, 1289 Forest Ave. (formerly Meislohn- Silvie). Funeral Mass is Saturday, Feb. 4, at 1030 a.m. at St. Roch’s RC Church, followed by a burial at Silver Mount Cemetery. Visitation is Friday from 2 to 4 and 7 to 9 p.m.
God Bless Ralphie and his family at this tragic time. What a great loss to you and to the community and USA. He served well and it is so sad to hear he left our earth so early. He is at peace in heavem. Ralphie…I miss you more than words. I keep thinking of how much fun the three of us had. I am so proud of you. Navy veteran, upstanding Police Officer….your last task…the D.A.R.E. program. The kids made you so happy. You couldn’t switch back to nights because you LOVED what you were doing. You exuded happiness. We were to see you in two days so you and Alan could watch the Super Bowl together. Plus, the two of you had a business plan to work on. I was proud of the both of you. Ralph??? …… What ??? I love you. Alan??? Make her stop! I can’t, that’s just what she does. Get used to it.